Ever since I was a little kid, the Jurassic Coast has held some sort of mystic allure for me. The very name of it always conjured up epic imagery of T-Rex and stegosauruses plodding around the coast, although my childhood imagination was probably a little off. 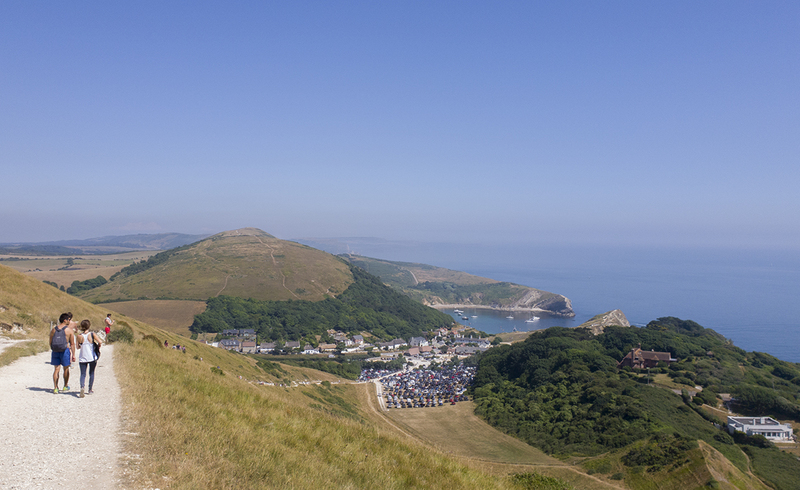 As it stands, the Jurassic Coast is the only place on Earth where you can view 185 million years of the Earth’s history in the striking landscapes, from the Triassic through to the Cretaceous periods. 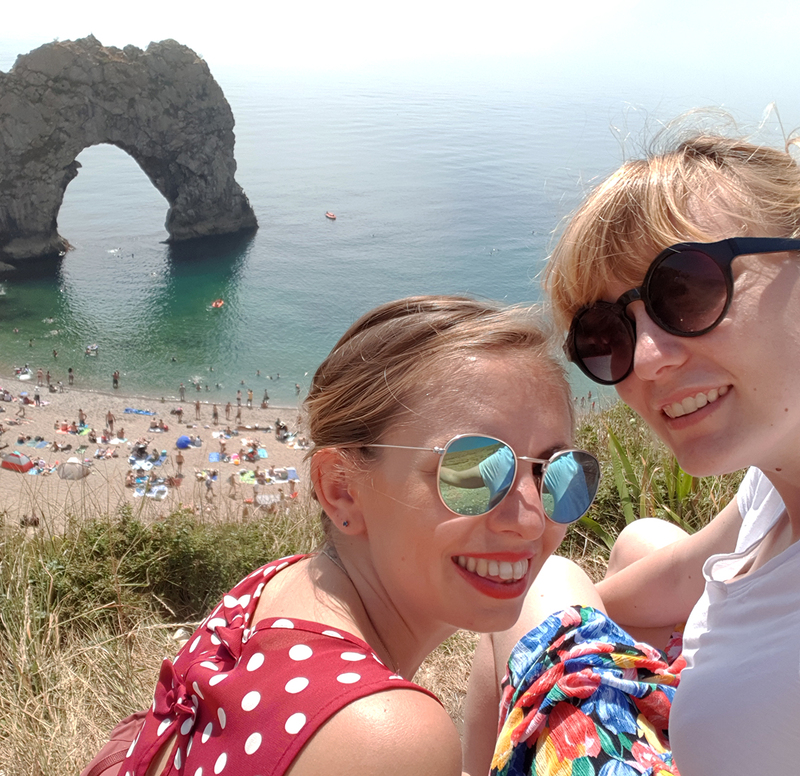 This summer, I’ve made it my mission to have more micro-adventures on my doorstep in England, and after Jodie (from The Little Backpacker) invited me down to her end of the woods before she moved to Dubai, I couldn’t resist! It was also a fab excuse to work on my photography skills – from how to change shutter speed to how to ace ISO. Ambitious? Yes. Almost as ambitious as the fact I was undertaking this trip as a day trip from London. I caught the 8:05am train from London Waterloo, and arrived in Poole at 10:13am. 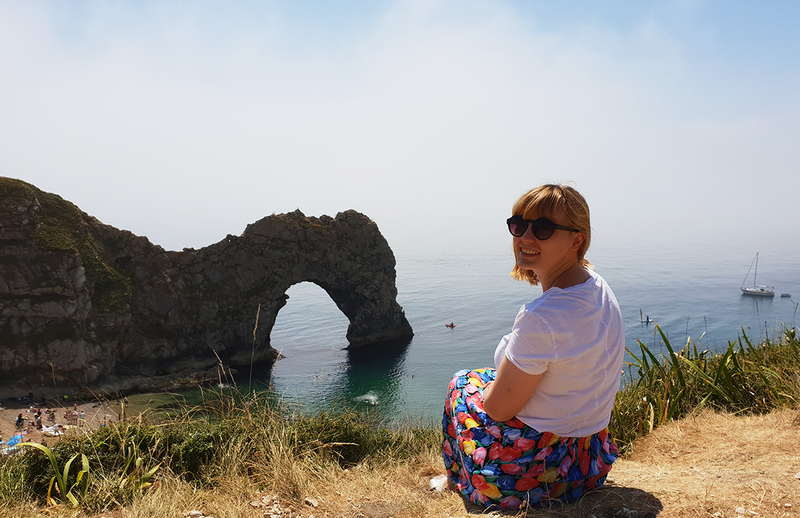 Over the next 7 hours, Jodie very kindly ferried us both around on our Jurassic Coast road trip, taking in some of the best-known and lesser-known sights in the area. I’d thoroughly recommend this route if you’re looking to get a feel for the area in a short space of time! 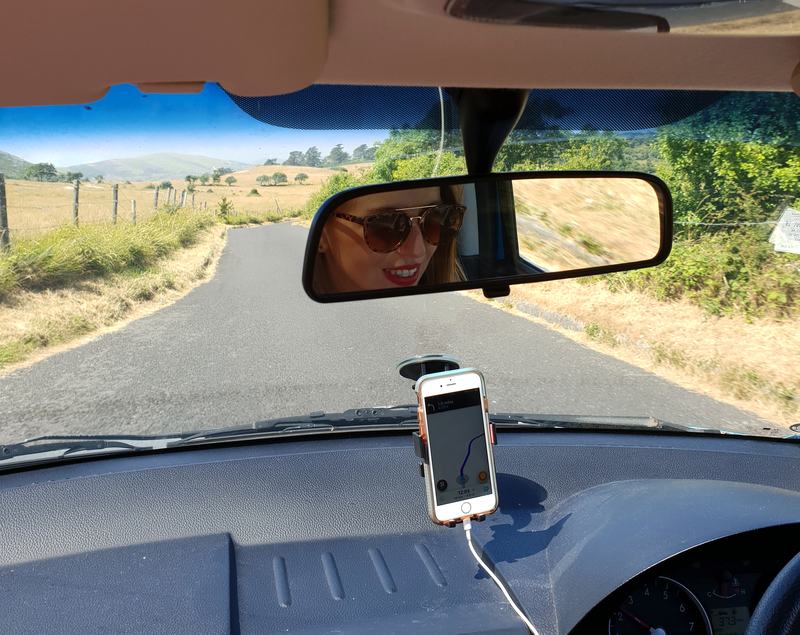 From castles to abandoned villages to striking coastal views – this is the route we took on our Jurassic Coast road trip. 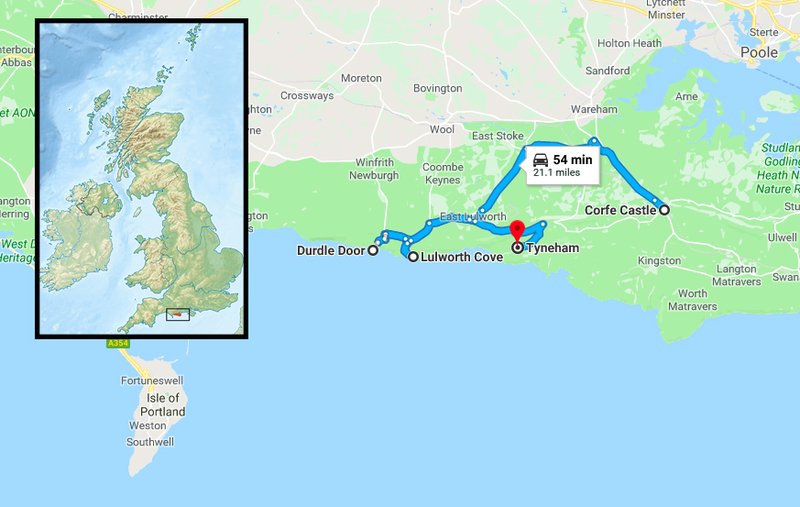 As mentioned above, I got off the train at Poole, but if you wanted to lop off a bit of the car journey you could always alight at the small market town of Wareham (or even Wool if you wanted to concentrate more on the coastal end). I wasn’t expecting this stop, but Jodie threw this one in as a bonus and I’m so glad she did! 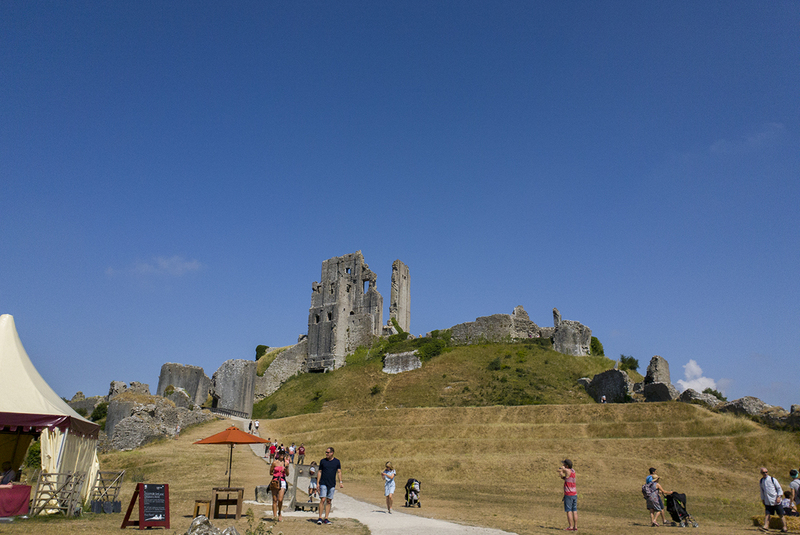 We parked up just off the road in the car park, and then walked up the slope towards the ruins of Corfe Castle. The castle was rebuilt in stone by William the Conquerer in the late 11th century, and throughout history its been a defensive site, royal palace and a family home. It was partially destroyed during the Civil War in 1646, but parts of its castle walls and interior building still poke out from the green slopes. 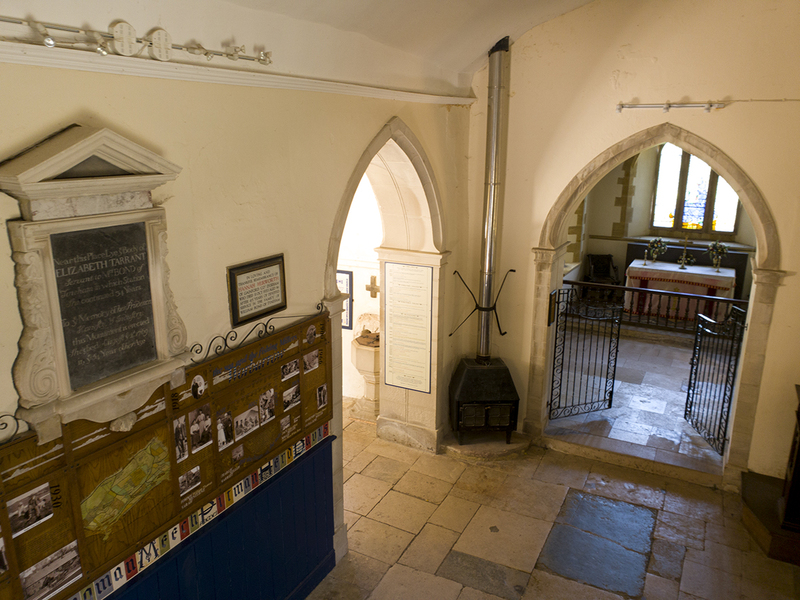 During off-peak times, the standard fee to look around the castle is £9.50 for adults and £4.75 for kids. 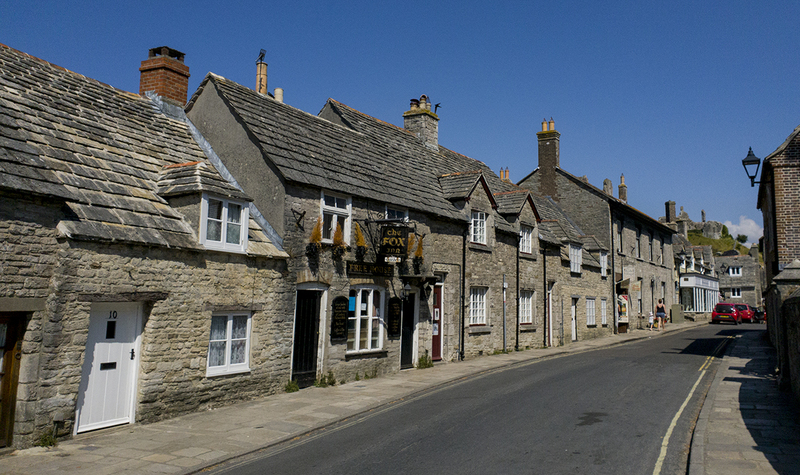 Because we were a little tight on time, we decided to give the tour a miss, but we did spend some time walking around Corfe village. 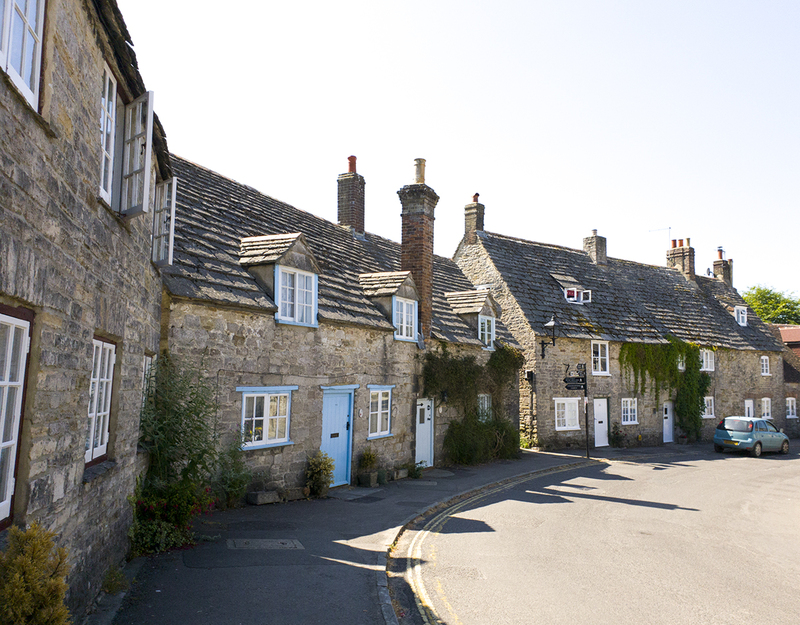 Built almost entirely from the local grey Purbeck limestone, the charming village is both uniform and quirky, with adorable chocolate box houses nestled into each other. 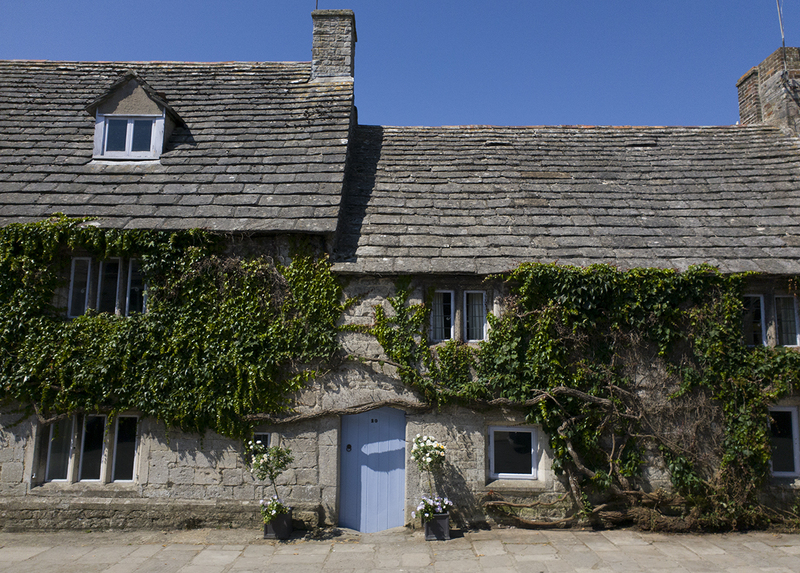 It felt like a sleepy Cotswolds village, and I quickly fell in love with how homely it felt! Definitely worth a visit if you’re passing. 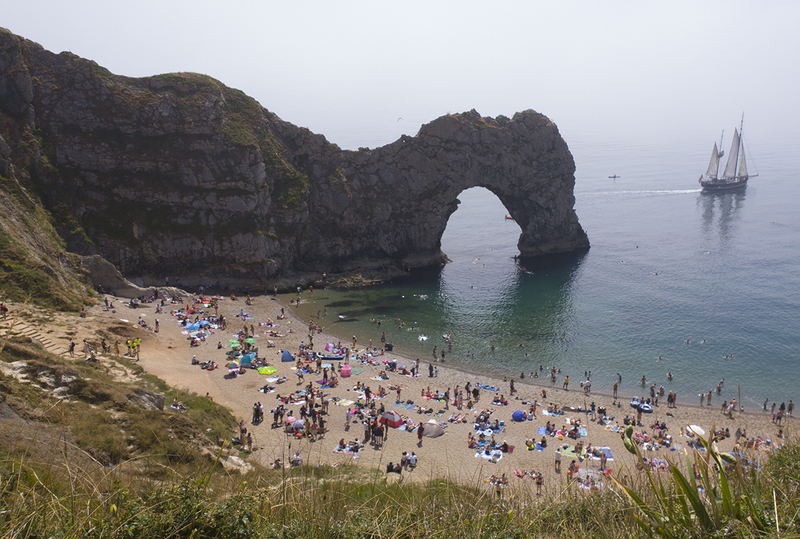 Heads up: Lulworth Cove and our next stop (Durdle Door) sit virtually next to each other. While you can drive between the two, you can also walk it via a mildly steep cliff walk. 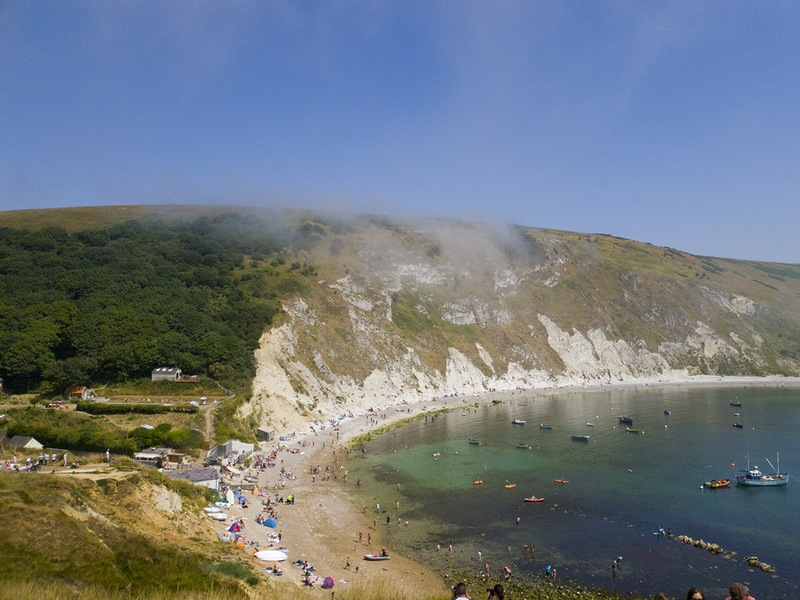 So, we parked up in the car park by Lulworth Cove for a few hours while we explored both. With low clouds drawing in, we hiked up a nearby slope to get a glimpse of the cove from above, before taking a walk along the pebbly beach and grabbing a local ice cream on our way back. I’d so love to go back here one day with a little family of my own! 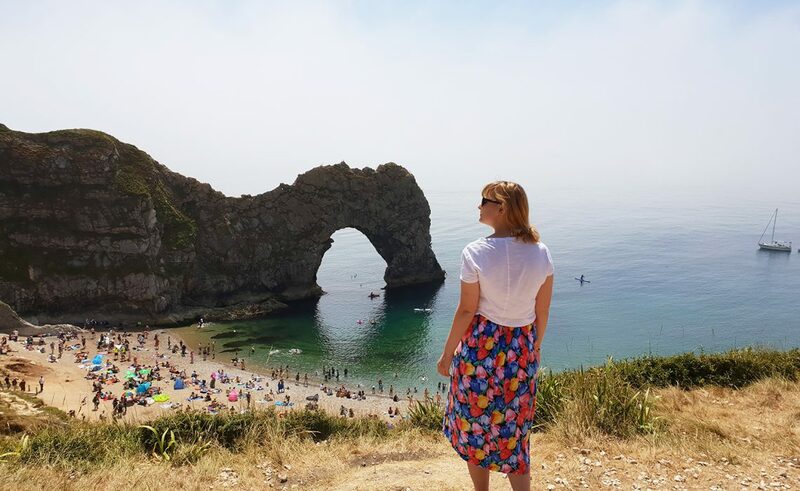 Durdle Door is one of the most famous stone arches in the world, and it’s also one of Dorset’s most photographed landmarks! So we couldn’t travel all this way and not see it for ourselves, could we? At least, that’s what Jodie and I were telling ourselves as we slowly hiked up the hillside from Lulworth Cove to Durdle Door. It’s not a long walk – it’s around 1.3 miles (or 2km) – but it is pretty steep. Both Jodie and I regularly run, but even our thighs were aching like crazy when we got to the very top! Although, to be fair, the heat and the fact we were wearing flimsy sandals definitely did not help. There’s no shame in stopping every now and then though to catch your breath. 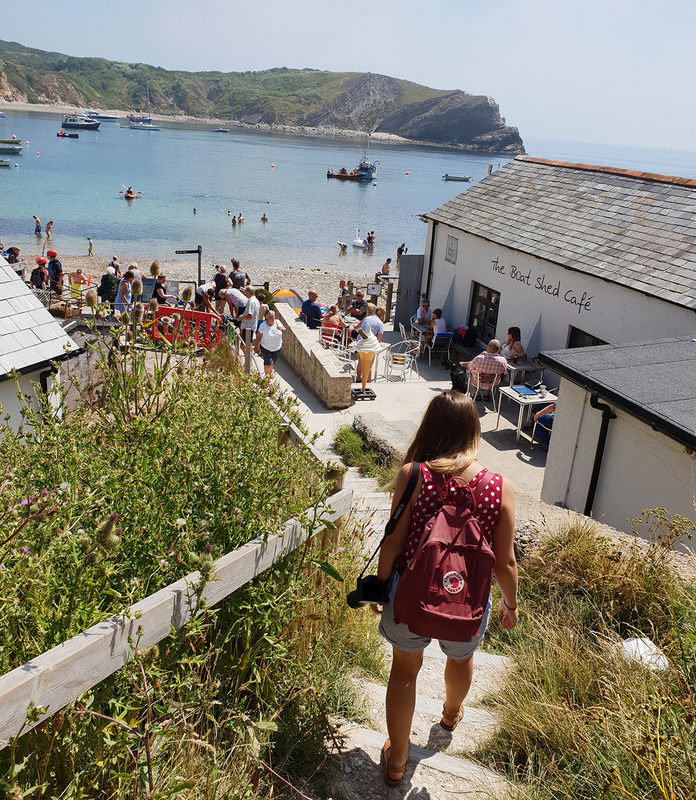 The walk up gives you gorgeous views out over the fields and back towards Lulworth Cove, so you can just say you’re taking lots of photos! A flatter walk along a coastal path gives you some striking coastal views. 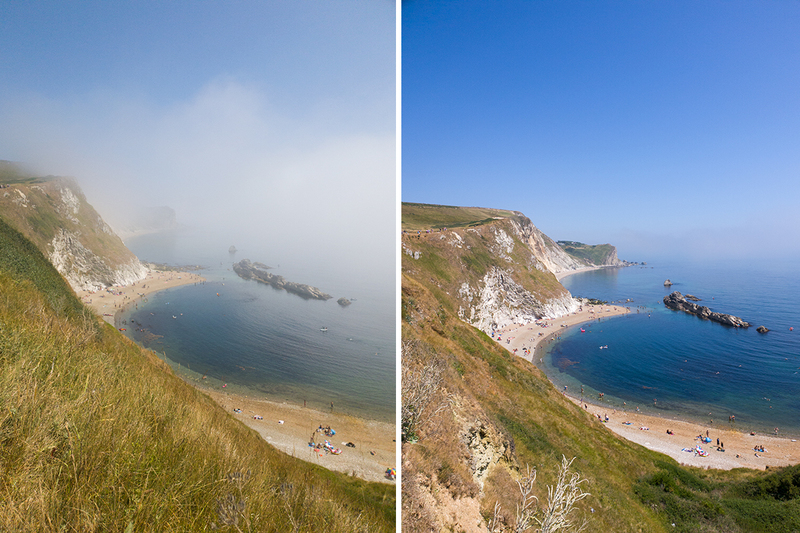 The low-hanging cloud from earlier was still hanging around on our walk towards Durdle Door, but on the way back it had completely dispersed, giving us two very different views of the coast in a short space of time. Spot the difference! It was obscenely busy on the beach itself, so we just took in the sight from above, watching people climb up the arch and then jump into the cool sea. There’s a little ledge that’s been seemingly naturally carved into the grass, so that’s where Jodie and I found ourselves eating crisps and getting a little sunburnt (oops). 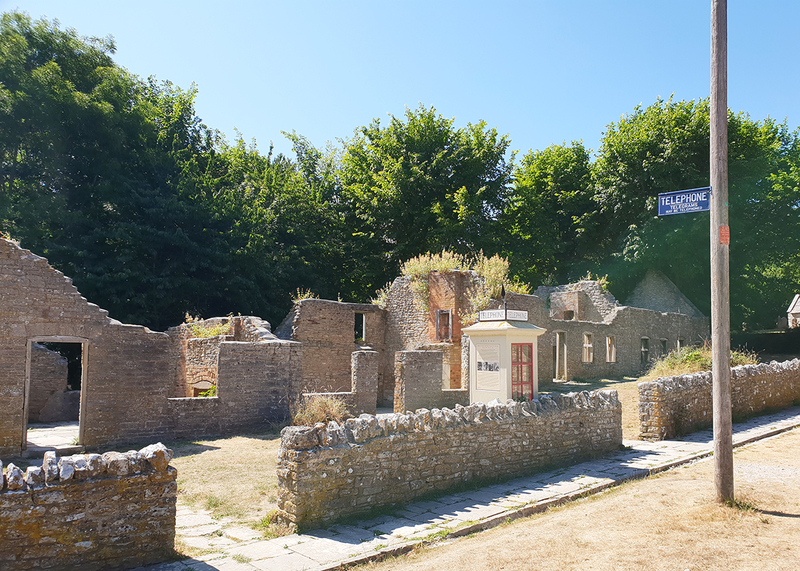 On our way back to Poole, we stopped off in the abandoned village of Tyneham. I’d heard about it from a few people over on Twitter, so the history nerd in me was stoked when Jodie suggested a stop here! It’s only accessible when the Lulworth military firing ranges are open to the public, so be sure to check out their website in advance. It’s free to visit, but the car park accepts donations. 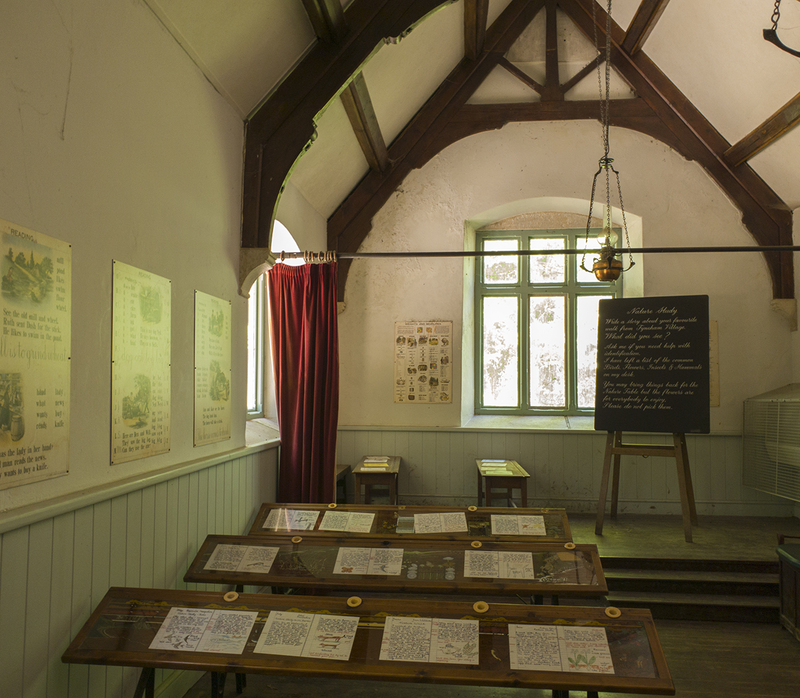 So what is Tyneham? Put simply, it’s a ghost village with a population of 0. The 225 residents were kicked off the land in 1943 by the War Office who acquired the land for use as firing ranges for training troops. They were never allowed to return to their homes again, despite promises to the contrary. Today, many of the buildings have crumbled and only the exterior walls still stand. However, in each property you can find information of the people who lived there, so you can get to know the lives and personalities behind those who were displaced. The church and the school house still stand, though, and you can take a look inside at all the props and village information. It’s as if everything has been frozen in time. After Tyneham, it was back on to Poole to catch my return train home. I won’t deny that it was a long and tiring day, but it was absolutely 100% worth it to get a feel for this part of England. 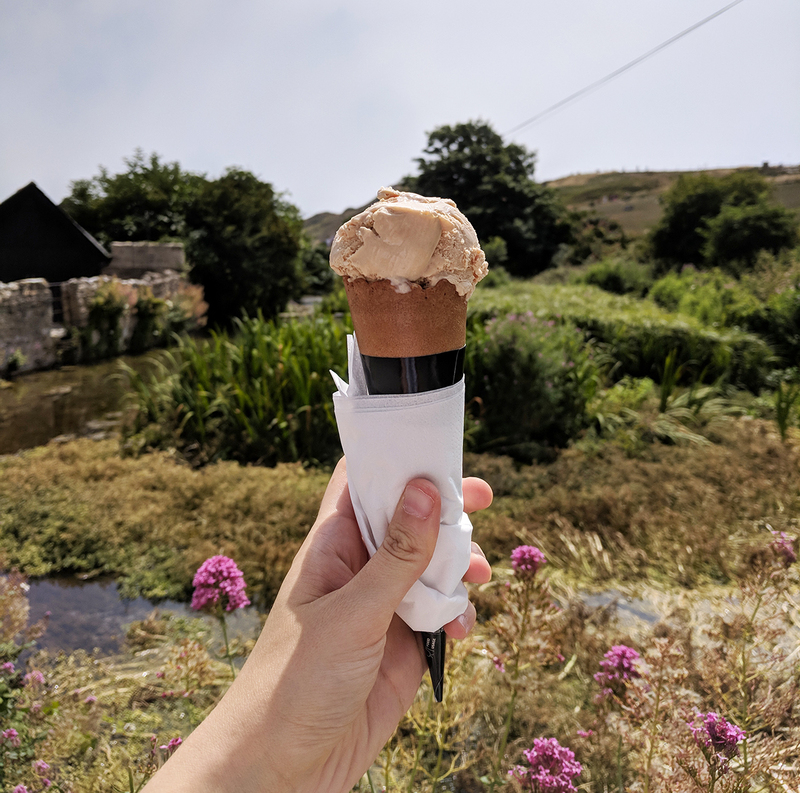 A one-day Jurassic Coast road trip won’t turn you into an expert, but it’ll make you hungry for more! This post is in collaboration with Panasonic Lumix, however all thoughts and road trip musings are my own!